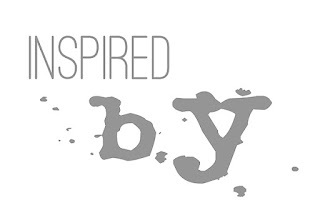 This "Inspired By" is a bit special one for me. As you may have noticed, my blog has been quiet for some time. It's because some time ago, first my right hand, then my left one stopped working. Or they worked but everything caused pain. It was a bit scary sensation, but now the situation is much better with physio therapy. As the situation is now better, I want to start blogging again as I have many projects to share. I thought 10th of the month, the "Inspired By" would be a good start. Naturally that post includes a lot more writing than my normal post, but I wanted to test how my hands work, are we getting back to normal. But what this hand situation caused is that this post is a bit different than other "Inspired By" posts. Even though we are doing things a bit differently than before, I always try to create something for the post. This time my hands didn't allow that, but I wanted to share what I WOULD have created if I would have had the possibility. A bit differently, I wrote. Do you remember, what that means? Inspired By is something sweet Marsha and me have been doing for years now. Until 2018 it was that we chose a subject to be inspired by and then did something inspired by that theme, a piece of art or a book. The inspiration could be anything but we both turned that into some kind of project and blogged the creation on the 10th. You can browse the past "Inspired By" posts from here (link). Inspired By is a playground, a concept we can use to explore, to play and to discover. We can do as much or as little we want and have time for. I guess it's not a surprise then that we both enjoy Inspired By very much but after doing it the same way so many years, we thought to change the things a bit. This year, 2018, we both just post on the 10th with some source of inspiration we found that month. Or rather on a period from the 10th of previous month to 9th of the current month. It can be a series of photos, a book we read, an artwork we saw, just a pebble on the street or a new product we bought. We can make something using that source, but it's more about sharing just the inspiration. Consider it as a window to our creative minds! Last month my older daughter attended a birthday party at Arkki - A school of Architecture for Children and Youth (link). She liked the party very much. Arkki in Helsinki, where the party was held, is situated in a place called Cable Factory. It's an old factory (where they made, surprise, surprise, cables!) and nowadays the place is filled with culture. The facility houses three museums, 11 galleries, dance theaters, art schools and there's several work spaces for different artists, for example. You can read more about Cable Factory here (link). While my older daughter was at the party, the rest of us were exploring what this culture space had to offer. We naturally dropped the party goer to Arkki, then went to Theater Museum (link) - which is on the same space as The Finnish Museum of Photography (link). We also kind of stumbled upon one of the galleries with many interesting works of art. When we were exploring, I immediately thought that this was it - that would be the IB for this month. I took some pictures, too, but after finding some interesting things at the Theater and Photography museum shop, I thought to use the ephemera. I also picked up a brochure of Arkki (above). What I loved about it was the whimsical city, colors and especially how the front of the brochure was shaped to form a city with layers and sort of perspective. The brochure somehow reminded me about Azoline's work. Before totally burying the idea of making something, I thought to paint with my toes using acrylics and then continue with felt pens to create a whimsical city of my own with the same kind of folded layers. I'm also a sucker for old photos. I love their color, I adore the black and white photography, and I would love to know the stories behind them. I bought the post card in the middle above from the museum shop but found a total treasure for free. The paperback book was free of charge and while the topic (workers' theater in Helsinki) wasn't that interesting, the photos inside were and are pure gold. Just look at those make ups! Most of the photos are from actors in their stage attire, but there's also a couple from the audience. I can't wait to use these in projects! And if these aren't enough, there's more! The last little piece in the photo above is a little note telling about free pictures the museum offers in the net. I found these very inspiring, but the gallery we visited was pure eye candy and hold enough inspiration for several "Inspired By" posts. 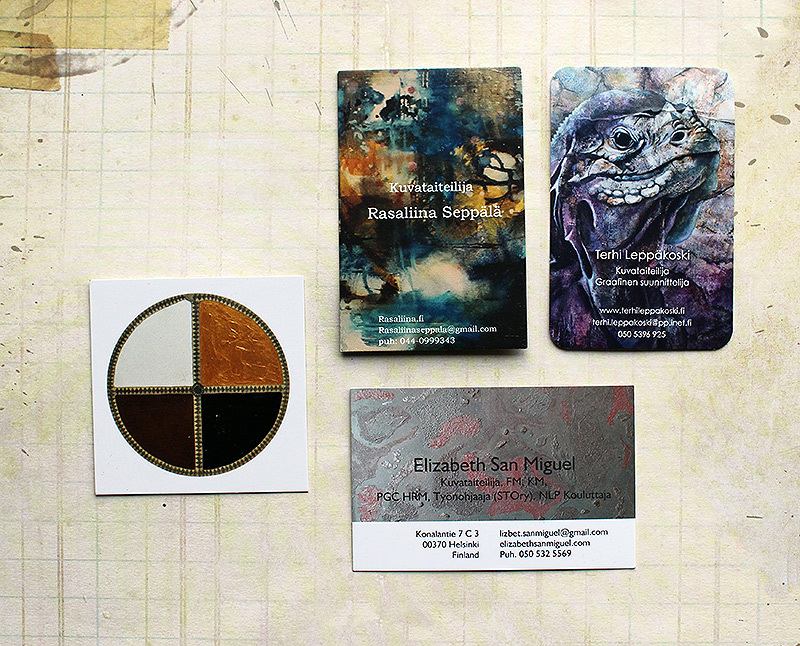 I was really happy to find calling cards from all the artists that really caught my eye in the show. Rasaliina Seppälä (link) really inspired me with her choise of colors, the textures, the collage effect and the splashes. The works were like poetry in pictorial form. There were really beautiful paintings by Terhi Leppäkoski (link) in the show. I really enjoyed especially the bird paintings she had on display with great, textural feel, but there were also really stunning horse pieces. The color schemes of the works as well as the hint of humor really inspired me. I also came to think about the superb works Linda Brun creates. What I found most intriguing about the works of Meri-Kaarina Rahkomaa (link), were her use of plywood. I also found her imagery beautiful and loved how she had added folklore to the works. Somehow they rang a bell, hit a spot so to say. I wasn't so keen on the paintings by Elizabeth San Miguel (link) but I really loved her altered books. Especially one with nails on it really shook me and spoke to me as a piece of art. So as you can see, there was a lot of inspiration to be found last month, but unfortunately I couldn't use it this time to make something concrete. But I can draw inspiration from this to new pieces and crafts. Thank you for stopping by today! Sorry for the long absence again! But now, let's see what's Marsha has been up to last month! Here's a direct link to her post (link).